A very pretty, petite, Georgian cast iron hob grate. The fire has a traditional design with curved front bars surrounding the integrated grate for burning. The hob grate top has flat warming plates that were originally used for cups or pans. 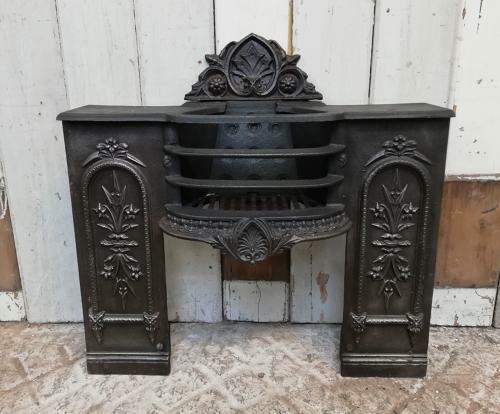 The fire has a beautiful design with ornate legs featuring a leaf and flower pattern with decorative border. There is an attractive design below the front bars and the fire has a decorative plate above the grill back plate. The iron has been blacked and polished and has an attractive colour and finish. The fire is suitable for decorative purposes or light use and is solid and well made. The fire does have some small marks and signs of wear due to age but is in very good antique condition. There is some surface rust to the back and some very small patches of surface rust to the front face. Some small casting marks can be seen and there are a few scuffs and marks to the feet. The fire is ideal for bedroom decoration or perhaps a kitchen or small reception room. The fire has wonderful character and would make a fantastic décor item for the home.